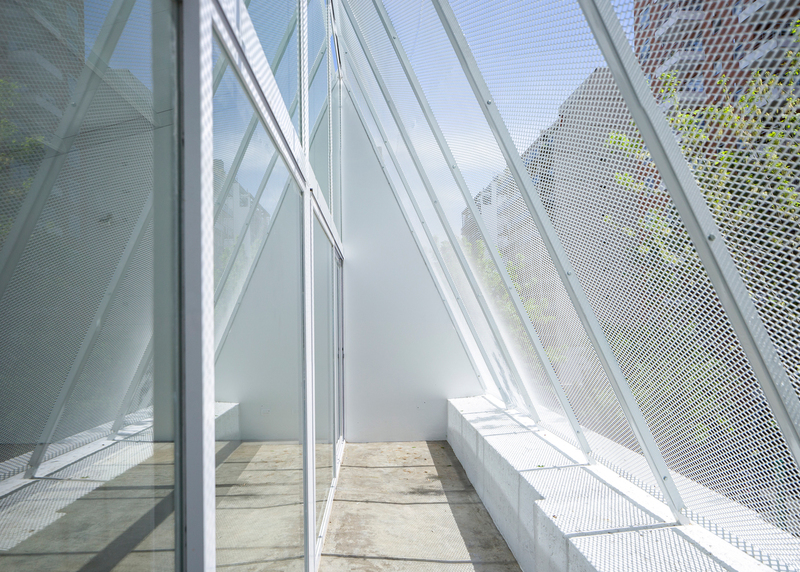 Argentinian studio Adamo-Faiden has built a greenhouse-like structure over the top of a Buenos Aires residence, in its continuing bid to make better use of the city's vacant rooftops. Aiming to take advantage of the "last surface of the city fabric", studio founders Marcelo Faiden and Sebastián Adamo developed the glass and metal extension to fit the stepped roofs of a trio of early 20th-century houses. It expands the block upwards towards neighbouring towers, creating valuable extra space for residents of a flat located underneath. "An accumulation of existing flat roofs at different heights becomes the floor for the new construction, distributing a series of indoor and outdoor areas that are connected together," said the architects. While the existing residence fulfils the clients' needs for conventional areas such as bedrooms and a kitchen, the extension is left unprogrammed. It can be used as a party venue, a workspace, a playroom or simply as a winter garden. Adamo and Faiden claim that city rooftops provide a territory that could open up new ways of living. Blas House is the latest in a series of projects by the pair that extend Buenos Aires' buildings upwards. "We are working on this field because it gives us freedom to explore contemporary ways of living," Faiden told Dezeen. The project shares similarities with the studio's MuReRe Houses proposal, which suggests creating parasitic social housing units on existing flat roofs around the city. "[Blas House] is a very important project for us because it materialises some intuitions previously explored in our 2009 MuReRe Houses," said Faiden. "Even when there's not a social goal in the commission, it gives us the opportunity to test ideas." "Trying to understand the urban fabric as an artificial ground is one of them. Instead of yearning an empty flat plot, we took every 'accident' from the existing roof as an opportunity to develop a specific environment for the extension," he added. Blas House's lightweight metal frame, mesh and glass construction was designed to help quicken construction time – an important factor as the clients remained in the existing house throughout the project. The combination of opaque, transparent and permeable components expose the area to the elements in varying degrees. There is also a separate entrance, so it can accessed directly from the street. "The new construction is just a big and thin envelope which modifies the conditions of the contained air, making no distinctions form inside or outside spaces," said the architects. "The other thing that the Blas House takes [from the] MuReRe project is the urgent need to create 'a new idea of luxury' not related to the isolation form the other citizens, [and] not related to very expensive materials." Adamo-Faiden's other rooftop projects include a simple glass and metal box set over the vacant roof of a 15-storey tower to create a home for a young couple, and a tent-like structure installed across the top of a renovated apartment block. "If the world is moving to an urban era, then the cities will have to find new ways growing incorporating leisure, taking it form the suburbs to the city centre," said Adamo. Photography is by the architects.